As eminent writer Ruskin Bond turns 72, he reflects on a range of subjects in a free-wheeling conversation with Rajnish Wattas about his life, writings, the publishing scene today and his love for the mountains. More than fifty years ago, a young Indian wrote his first book at 17 and went on to win the prestigious John Llewellyn Rhys Memorial prize. Today, he continues to enrich our world with his muse. 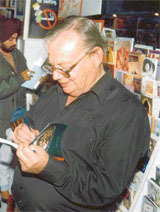 Ruskin Bond is certainly one of our most modest and low-profile writers. Bond has been influenced by classics and the works of some short story writers like Anton Chekhov, H.E.Bates, William Styron, Rudyard Kipling, Somerset Maugham and Katherine Mansfield. Among the Indian writers, he has deep respect for R.K. Narayan, whose birth centenary falls this year. In fact, there is a lot of commonality between Bond and Narayan, in the sense that both writers have brought their own little worlds of Dehra and Malgudi endearingly alive and close to the hearts of their readers. “Narayan writes simply without recourse to bombast. He’s out to tell a good story and create believable characters with whom the readers can identify their lives and day-to-day problems. That’s a part of his lasting appeal,” says Bond. Bond’s writings carry the fragrance of the Garhwal hills, landscaped with pine knolls, gurgling streams and wild flowers. And his words flow with the ease of a mountain stream. Sometimes rapid like a torrent; sometimes languorous like a river. It takes a Ruskin Bond to turn the ordinary into an extraordinary story. He tells nostalgic stories of quaint bazaars, remote railway stations and small towns. Occasionally, eccentric uncles, schoolboys and drunken postmen bring delightful mischief to his vignettes of life. “Yes, my decision to settle down in Mussoorie has a lot to do with my inspirations from the mountains and mining material from there for my work. The hills have been kind to me,” says Bond. What’s a typical day in his life? “I like to get up early, to see the beauty of dawn breaking, a time when the whistling thrush too comes calling. And when I’m done with this ritual, I go back to sleep… till someone gets me a cup of tea.” Surely Bond lives life at his own languid pace. No wonder, his latest book is titled Sunny Side Up—as that’s the only way Bond knows how to live life. Another book that’s on the anvil will be titled A Town Called Dehra. After the superb success of the film The Blue Umbrella, based on his short story, at the film festival in Goa, a tele-serial called The Dehra Kids is now in the works. 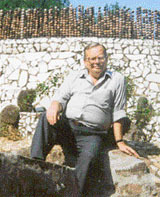 Ruskin Bond will be turning 72 on May 19 but the romantic recluse of the mountains still retains his innocence and a sense of peace with the world. “He is a writer who deals with solitude… in the most understated way,” says V. S. Naipaul in a recent tribute to him.